07.05.2009 - The German Cup Final Four will be played in Hamburg this weekend. 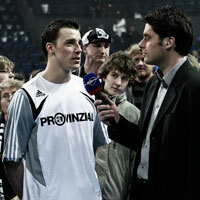 01.05.2009 - Key players and coaches comment on the Löwen-Kiel game. 01.05.2009 - By beating THW Kiel 31:30 Rhein Neckar Löwen took some revenge for the first leg. Nevertheless, Kiel are in the Final. 28.04.2009 - Though Löwen only have slight chance for the Final, this has been the most successful season for the club ever. Coach Wolfgang Schwenke talks about his experience in the CL.